2 1 Month / 2 Months / 3 Months CRASH COURSE for CAPF AC Exam Coaching. 3 Daily 5 to 6 hours Classes for the CPF AC Appearing Candidates. 4 Special Assistant Commandant Target Batches for Graduation Appearing Candidates. 5 Hostel & PG Facility – Available for Assistant Commandant Students. 6 Especially Designed +15 Booklets Provided to the Cadets for Assistant Commandant. 7 Best Teachers Available for CAPF AC Exam Preparation’s. 8 Optional Green Card Facility for Assistant Commandant Candidates those wants to free Re-Join. 9 Regular Revision of Previous Year Question CPF AC Exam Paper provided to Every Student. Delhi Career Group is the one way to go for achieving the best career opportunity in Central armed forces. The one and only coaching center in Delhi which covers the most parts of Delhi including the most crowded areas of Delhi. We deliver our Best Assistant Commandant Exam Coaching In Delhi at our branches at different locations incorporating Mukherjee Nagar, Noida (Uttar Pradesh), Faridabad, Sonipat, Ghaziabad (UP), Badarpur, Munirka. There are more areas which we have covered under our Educational Society to serve you with Assistant Commandant Preparation Institutes In Delhi like , Karol Bagh, Uttam Nagar, Punjabi Bagh, Rohini, Dwarka, Delhi NCR, New Delhi, GTB Nagar and Laxmi Nagar. Our main aim is to make everything related to coaching at your local area in Delhi. We are the most prestigious training center for entrance exams for central armed forces. 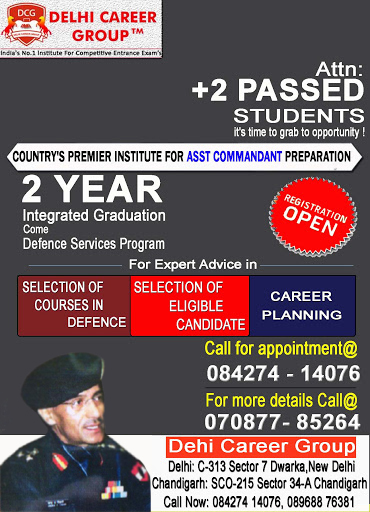 Delhi Career Group is ranked top as CAPF Assistant Commandant Coaching Center in Delhi. There are other additional posts in central armed forces and we cover the training for those exams which are required to get those additional posts. Every now and then people get mislead by various things and we are the one which save you from losing the right path of success. We provide you the AC Central Armed Police Forces Exam Preparation which will help you get high grades and get your desired jobs in armed forces. One thing is important here to tell you that everyone would require passing physical test to get jobs. UPSC conducts the exam for CAPF which is the primary step to achieve the job in armed forces. After you pass this exam you will go through the physical examination and after clearing that exam you can be recruited as armed police force officer. Delhi Career Group provides you Classes for CAPF AC in Delhi so that you can get your chance to go for physical test. Our coaching is your first step to go ahead to make a career in central armed police force. Our UPSC CAPF Assistant Commandant Coaching in Delhi is by far the best from other institutes as we give you assurance about high grades and be on top of merit list so that are chosen for physical examination and increase your chances of being selected as one of the professionals in armed forces. CPF exam coaching is made easily available at your local area by Delhi Career Group with least possible cost. One can achieve their dream of becoming member of central armed police force by our Central Police Forces Assistant Commandant Coaching. We are giving you the opportunity to put the first step in an easy way because after that passing the physical exam is tough. So we are making your start convenient and worry free so that you can concentrate on your physical test which is compulsory to pass for any individual who is willing to work in central armed police force.